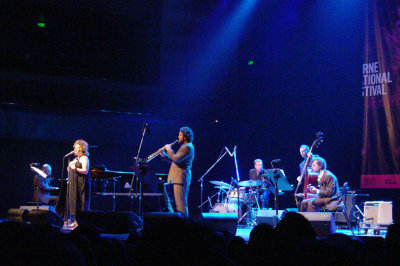 IT was a dilemma: the hardly ever serious Actis Dato at BMW Edge or the seriously promoted and popular Katie Noonan’s Blackbird Project at Hamer Hall, along with the boys from FGHR (drummer Daniel Farrugia, guitarist Leonard Grigoryan, pianist Luke Howard and bassist Ben Robertson) in the supporting role. As usual, I timed things badly, dropping in to hear the Italian antics, but leaving in a bid to catch FGHR. Bad move, because the half-hour interval at Hamer Hall began soon after I arrived. Actis Dato (Carlo Actis Dato, sax and bass clarinet, Beppe Di Filippo, alto saxophone, Daniele Bertone, drums, Matteo Ravizza, electric bass) launched energetically into what might have been titled “Pantas del Fuego” (suggesting visions of flaming trousers, but billed as a northern Italian political song), which was loads of fun. 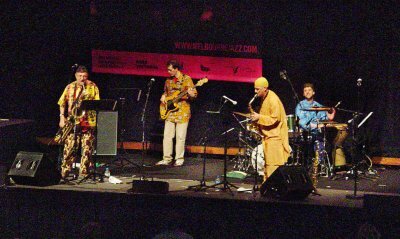 With verve and vitality they set feet tapping, repeating rhythmic patterns and indulging in lots of pointing, jumping and hip shaking. Was there a screaming blowfly on stage? A face-off began Perestroika, with the horn players folding their arms as they eyed each other in mock aggression. It seemed so full-on that I wondered whether they would ever vary the pace. In what might have been titled Che Guevara, the horns were in unison, the drummer did some pa rum pum pum pum, al la the Little Drummer Boy, and the guitarist finally made his presence felt. Actis Dato seemed to be drawing on folk, gypsy and African influences, but the categories are irrelevant. It was racy and often raucous, but also beautifully melodic and engagingly rhythmic. So, off to the Hamer Hall, where the interval was uneventful. Then, Katie Noonan’s Blackbird Project — the songs of Lennon McCartney — brought us 12 songs plus an encore, with Zac Hurren on tenor sax, Sam Keevers (who wrote the charts) on piano, Stephen Magnusson (is he everywhere?) on guitar, Brett Hirst on bass and Simon Barker on drums. They were all in suits — except Katie. To put my cards on the table, and no discredit to Katie Noonan, but I’m not a fan of her voice, though many people seem to love its purity. The audience reaction seemed positive, but I wondered how fans of the original songs reacted to these interpretations. In Yesterday, Noonan’s voice was the only source of melody, which might have challenged some. And in the instrumental Norwegian Wood, Hurren seemed too abrasive and the arrangement too “out there” for such a beautiful song. I began to warm to the project by the seventh song, Across the Universe, when Magnusson was (as always) magnificent and Noonan’s voice soared up with the special-effects smoke for the line “nothing’s gonna change my world”. And in Lennon’s In My Life, there was more guts and feeling to Noonan’s vocals, backed by great guitar. When Noonan sang her favourite lyric — “Each one believing that love never dies, Watching her eyes and hoping I’m always there” — in Here There and Everywhere, accompanied by only guitar and bass, the result was most effective. What was happening? Some great solos in Fool on the Hill were followed by Noonan showing much more of the depth and power of her voice in The Long and Winding Road, ending with great expression in the line “lead me to your door”. Was I being won over? In Eleanor Rigby there was heaps of energy, with variations in the timing and rhythm, Hurren going for it on sax and Magnusson standing for a solo before Noonan delivered some rapid-fire v0cals and sustained notes. The audience called for more and Katie Noonan returned to the stage with Brett Hirst for some vocal improvisation in I Will. Can I say the concert ended on a high note? (Sorry). But I concede that I was more impressed than I expected. Let’s hear more of Noonan digging deeper into her vocal range. This entry was posted in MIJF 2009 and tagged BMW Edge, Brett Hirst, Katie Noonan, Lennon, McCartney, melbourne international jazz festival, MIJF, Sam Keevers, Simon Barker, stephen magnusson, Zac Hurren. Bookmark the permalink. Will be filling in some of the unfinished posts and then posting more gigs and CD reviews. As well, I am uploading some old CD reviews gradually.